There are so many hounds in need of loving homes. We are excited about each application for adoption received and look forward to helping you find the hound match that is best for you and your family. Due to the importance of finding a safe match for cat resident homes, we ask for your understanding with placing likely cat safe hounds with homes with cats; homes without cats should choose from the not likely cat safe hounds so that when a cat safe family comes along, there are hound matches for them too! For more information, please check out not-cat-tolerant and cat-tolerant. Your application will be delivered to a few adoption coordinator volunteers who work diligently to process applications efficiently. You will be contacted by one of these volunteers regarding the status of your application. The adoption coordinators will share your interest with fosters of the dogs you are interested in and will reach out to you with additional information from each hound’s foster regarding the hounds’ personalities and such. 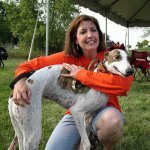 Don’t forget to check out the events tab on the American Greyhound website for various Meet and Greet opportunities in various locations in Indiana and Illinois. Meet and Greets are a wonderful opportunity to meet a number of Greyhounds looking for homes in one location and our primary method of connecting hounds with their forever homes. Meet and Greet venues additionally offer an opportunity for current canine family members to meet the potential adoptive hound to get a feel for compatibility. Introductions to current cat family members are best made in the home, with the new hound wearing his or her turn out muzzle when interacting with feline family members until it is determined by the family that it is safe to allow interactions without the turnout muzzle on the dog. You can check out our Facebook page for additional info on events and available hounds too! If, for any reason, your newly adopted hound family member isn’t working out in your home, contact us for insight and assistance as soon as possible. We are here to help and serve as a resource. Also, if for some reason a particular hound is not working out in your home (not working out with other pets, children, etc), American Greyhound will take the hound back and find another home that will work out. Remember that all our hounds have been welcomed into their foster homes and are much loved during their stay and it is required that they be returned to American Greyhound if, for any reason, they cannot stay in their adoptive home.